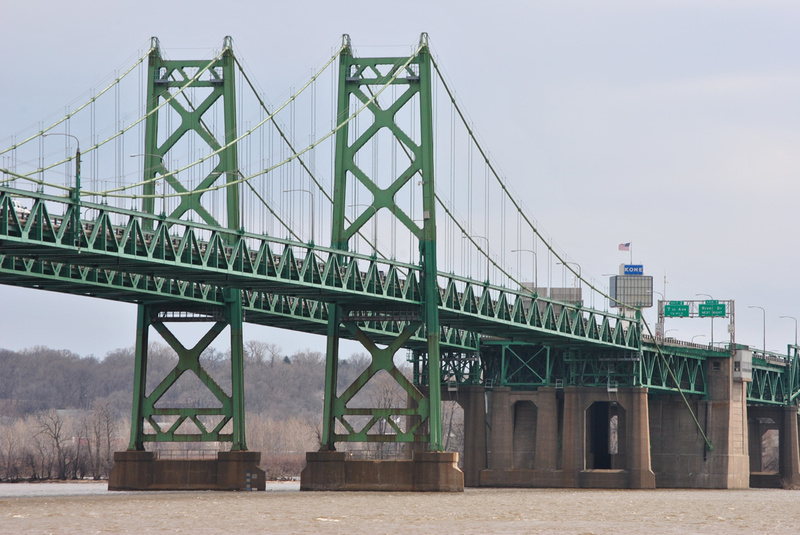 Constructed originally as a single span across the Mississippi River in 1935 for U.S. 6, the Iowa-Illinois Memorial Bridge was incorporated into Interstate 74 by November 26, 1974.3 The second span (southbound) was added in 1960, and until January 1, 1970,3 tolls were collected to cross the Mississippi River.1 This westerly view looks from the river levee near the Isle of Capri Casino in Bettendorf. Interstate 74 leads south from Interstate 80 in a rural area of northeastern Davenport by the Rhythm City Casino Resort. Generally serving commuter or local traffic, I-74 separates Bettendorf and Davenport south from 53rd Street to the Mississippi Riverfront. 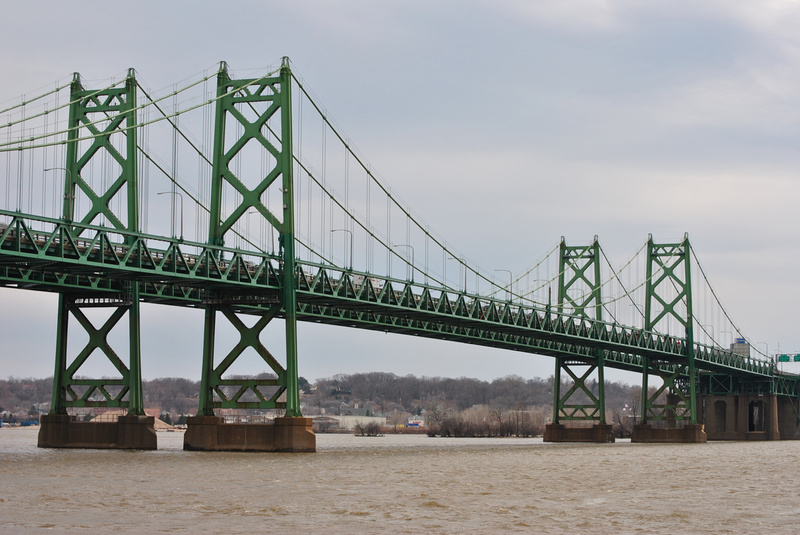 The Iowa-Illinois Memorial Bridge, a four-lane suspension bridge, currently takes the freeway to Moline, Illinois. 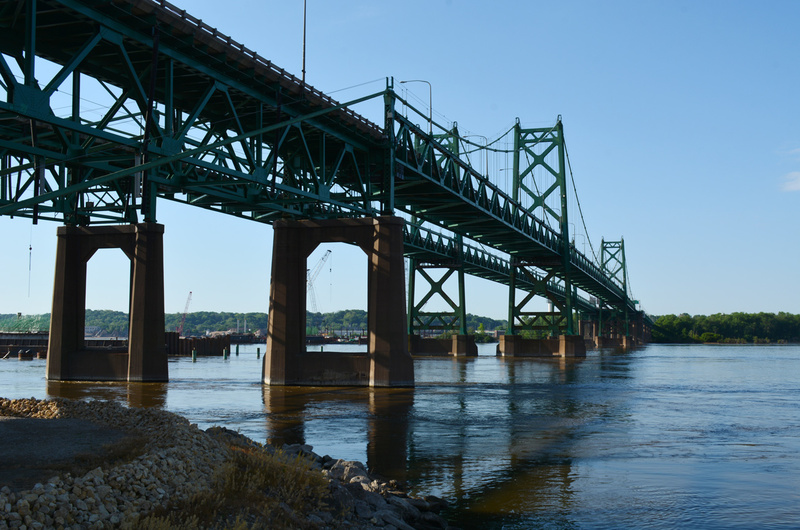 A new basket-handle, true-arch twin bridge for Interstate 74 & U.S. 6 is under construction to replace the Iowa-Illinois Memorial Bridge. 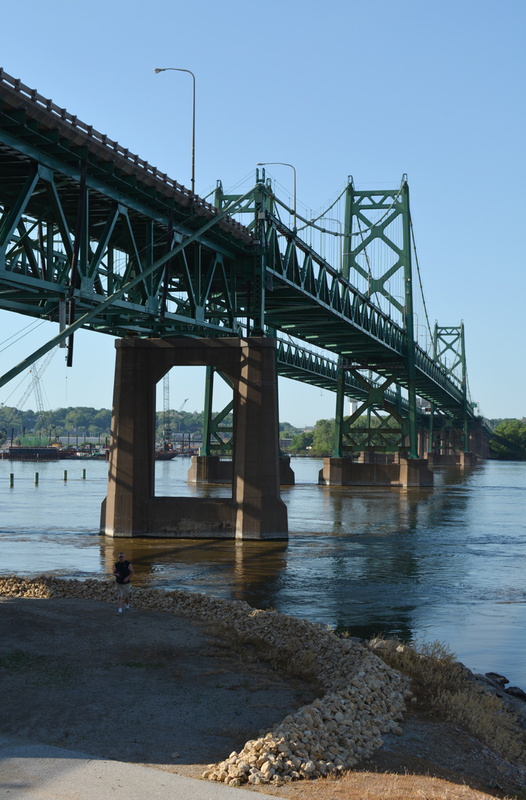 Earlier plans suggested a 2012 start date for work on the replacement span, with an eight year time table for completion.2 Initial land acquisition for the new bridge approaches finally got underway in 2013.3 Subsequent construction in 2016 shifted roadways in Downtown Bettendorf and completed demolition work for the new right of way. 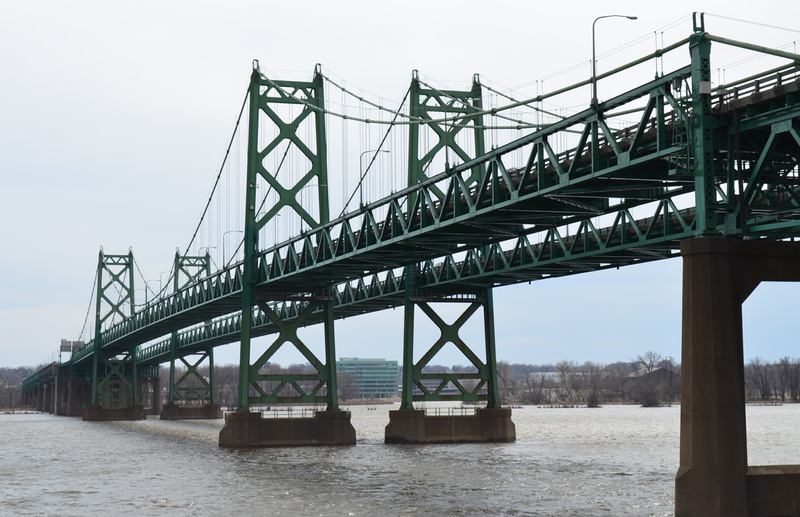 Construction for the bridge foundations commenced in the summer of 2017, followed by work building the spans on either side of the Mississippi River and grading in Bettendorf. 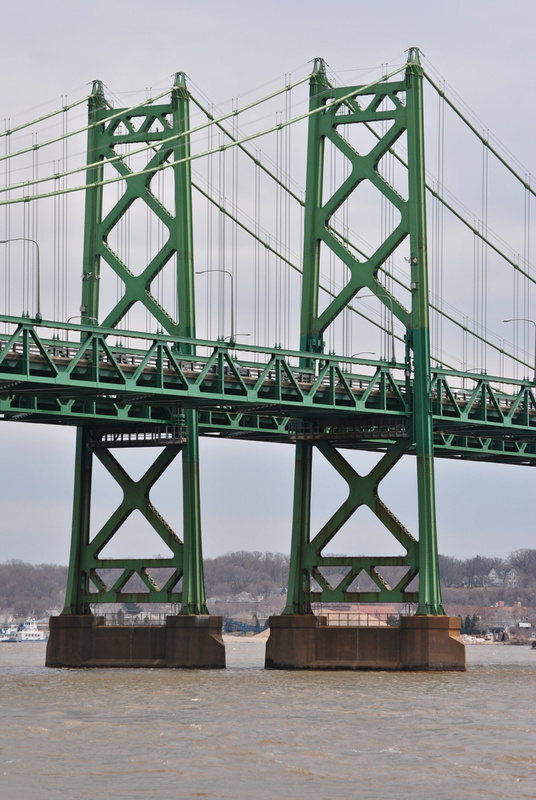 Totaling around $400 million, the first phase of the bridge work was the largest letting in Iowa history. The $1.2 billion bridge is expected to opened to traffic in 2020,4 with Phase 2 wrapping up in 2021 with demolition of the existing suspension bridges. 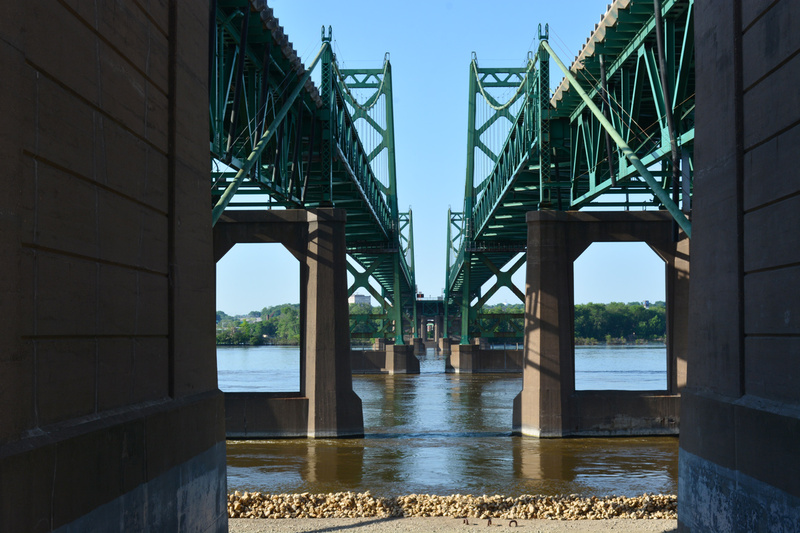 Improvements are slated for all of Interstate 74 between the 53rd Street interchange (Exit 1) to 23rd Avenue in Moline, Illinois as Phase 3 of the I-74 Mississippi River Bridge project. Interchange redesigns or expansion, freeway widening to six overall lanes, and safety improvements are planned for the entire freeway. Of those, the 53rd Street interchange upgrade project was completed in November 2012. The remainder of the work is anticipated for 2022 or later, depending upon funding. 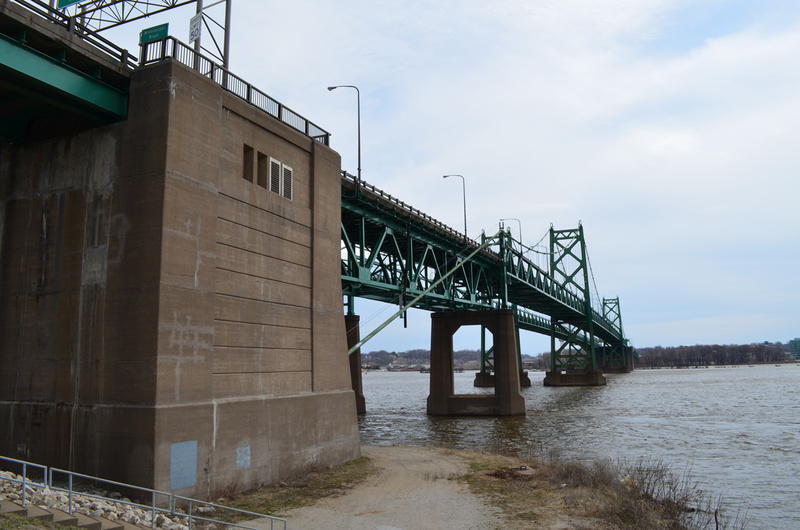 Additional views of the Interstate 74 & U.S. 6 - Iowa-Illinois Memorial Bridge from the north (west) banks of the Mississippi River in Bettendorf. 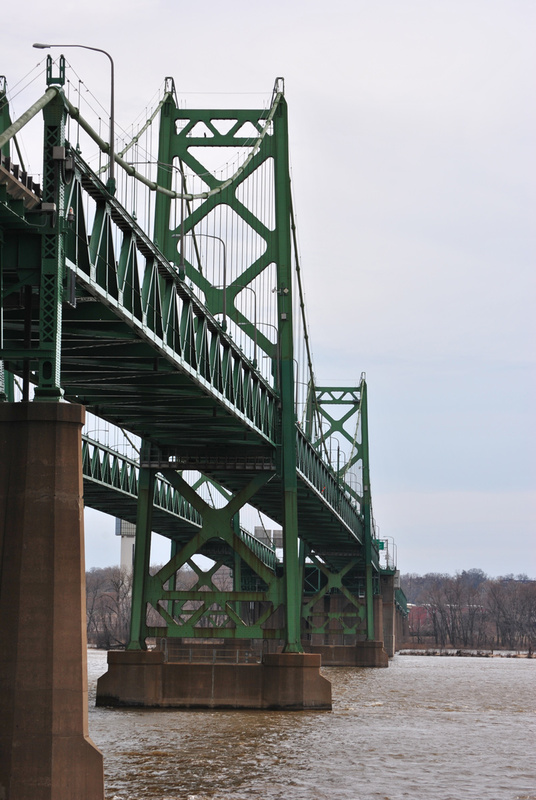 The bridge was dedicated to veterans of World War I when it opened November 18, 1935 at the cost of $1.5 million. 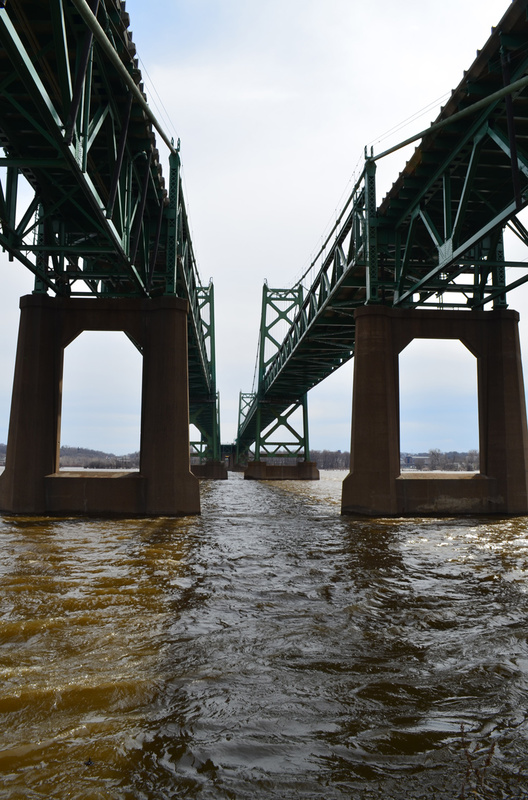 Work began in 1958 on the second bridge, costing $8.1 million. 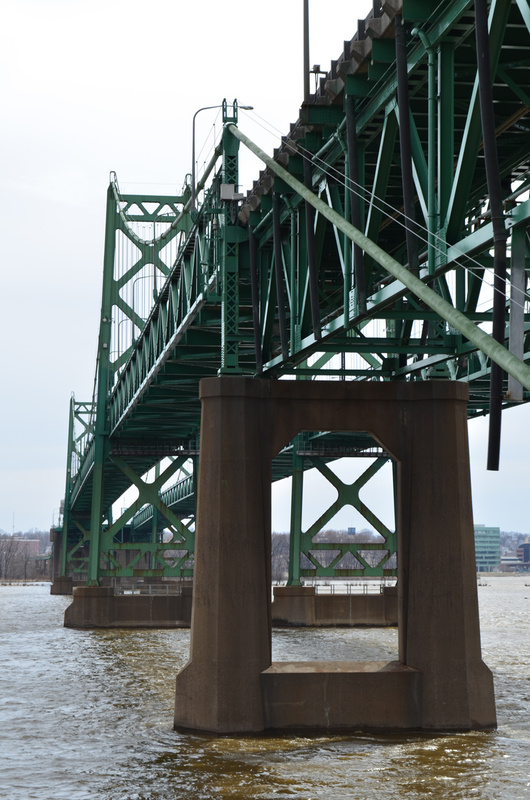 This span would open by November 1959, to carry both directions of travel as crews repaired the original span. Full opening of both bridges followed on January 20, 1960.3 Photos taken 05/26/08. 14th Street flows north from U.S. 67 (State Street) and the I-74 & U.S. 6 westbound off-ramp to split with Kimberly Road at Mississippi Boulevard. Kimberly Road provides return access to I-74 west from the Bettendorf Riverfront as 14th Street stays north to Middle Road. Photo taken 05/29/18. Kimberly Road veers west from 14th Street to a half diamond interchange with Interstate 74 & U.S. 6 west. The former alignment of U.S. 6 continues along the west side the freeway to Exit 2. Photo taken 05/29/18. 53rd Street eastbound at Interstate 74. 53rd Street constitutes a busy east-west arterial between U.S. 61 Business (Brady Street / Welcome Way) in Davenport and 18th Street in Bettendorf. Due to increasing traffic congestion, the exchange with I-74 was expanded from 2010 to November 2012. Two loop ramps were added from 53rd Street to the freeway. A lane drop occurs at the eastbound on-ramp from 53rd Street now. Photo taken 05/29/11. The loop ramp opened from the right side of 53rd Street east onto I-74 west opened to traffic on June 15, 2012. Photo taken 05/26/18. 53rd Street continues to traffic lights at Corporate Park Drive and Utica Ridge Road. Interchange construction between 2010-12 expanded the road to six lanes between Elmore Avenue and Corporate Park Drive. Photo taken 05/26/18. Westbound 53rd Street meets Interstate 74 west of Corporate Park drive. Photo taken 03/28/16. 53rd Street now carries six lanes across Interstate 74. Non state named shields and new overheads were installed by 2012 when the interchange upgrade was completed. Photos taken 03/28/16. 2010-12 construction resulted in a significantly expanded 53rd Street with a concrete median. The left turn signal phase was eliminated with the new loop ramp for Interstate 74 east. Photo taken 01/01/15. I-74 (Jason Hancock, Iowa Highways). Renew Moline | I-74 Bridge Corridor http://www.renewmoline.com/RenewMolineI-74BridgeCorridor.htm. 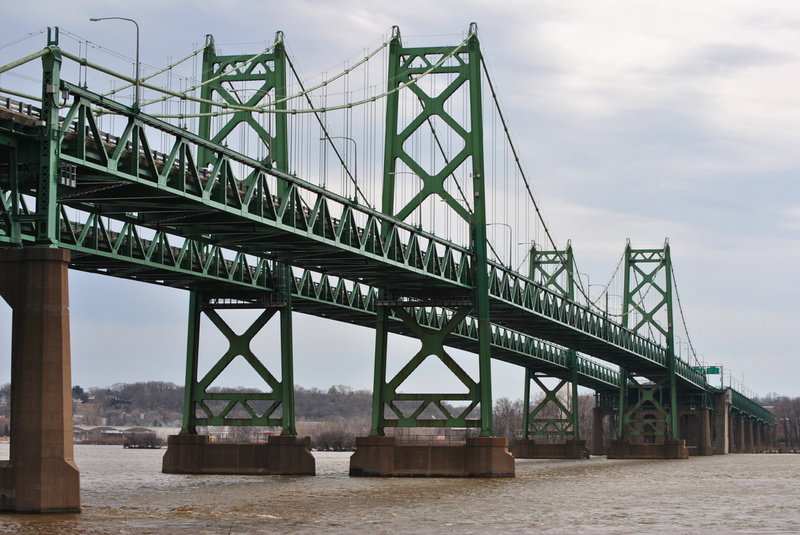 "New I-74 Bridge will finally be a reality." WQAD, Quad Cities, November 19, 2013. 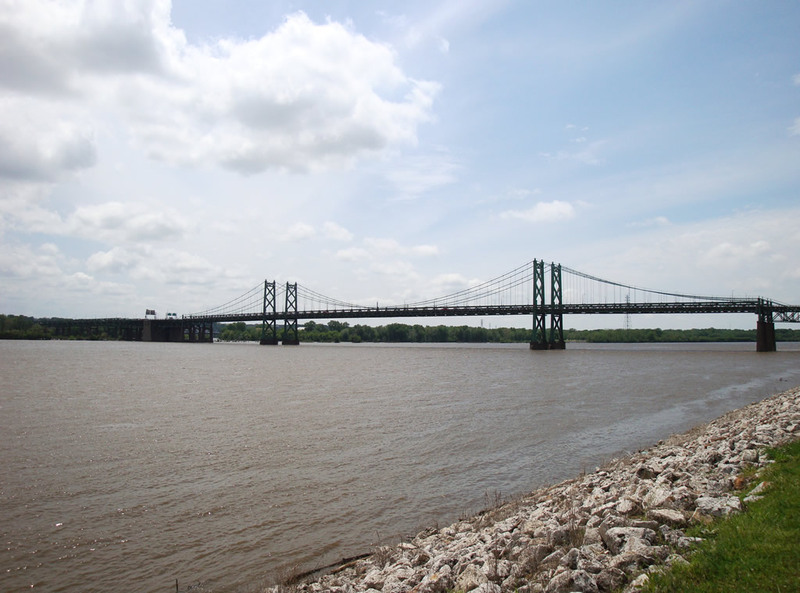 Mississippi Bridge Timeline http://qconline.com/progress2005/stories.cgi?section=pr051&prcss=display&id=228840, Quad-Cities Online. 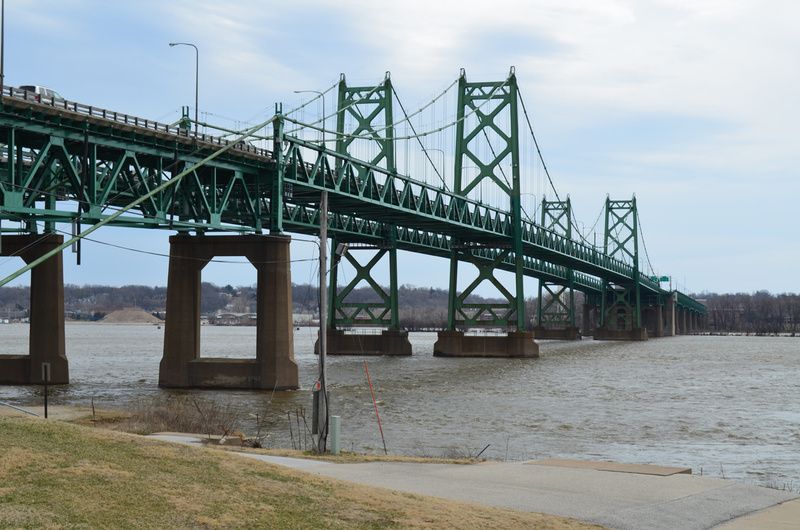 "I-74 bridge foundation work set for this summer." Dispatch-Argus, February 8, 2017.